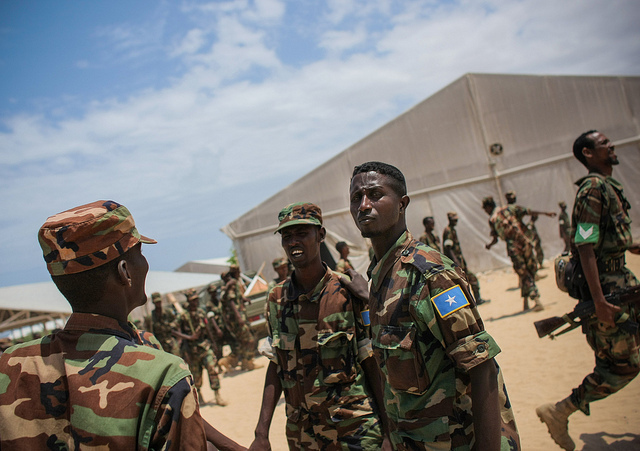 Up to 30 percent of Somalia’s national military is unarmed, according to the government’s “Operational Readiness Assessment”. The study comes as Somalia prepares to lead the fight against militant group Al-Shabaab as troops participating in the African Union Mission in Somalia (AMISOM) pull out of the country. Experts warn that Somalia’s national army isn’t ready to take on the nation’s civil conflict alone. In the latter part of 2017, Al-Shabaab has targeted a number of government military bases. The extremist group has overrun four bases since September, killing more than 60 troops and seizing large amounts of weapons in the process. According to the government’s military assessment, as many as 30 percent of soldiers are manning bases completely unarmed. While some units lack the medium and heavy weaponry they need and some are also undermanned. The findings support claims from various experts who warn that Somalia’s army is not capable of leading the fight against Al-Shabaab on its own. On Tuesday, Defence Minister Mohamed Mursal Sheikh Abdirahman admitted that there are “gaps” in the country’s national defences. “There are gaps, there are brigades which are undermanned,” he said.